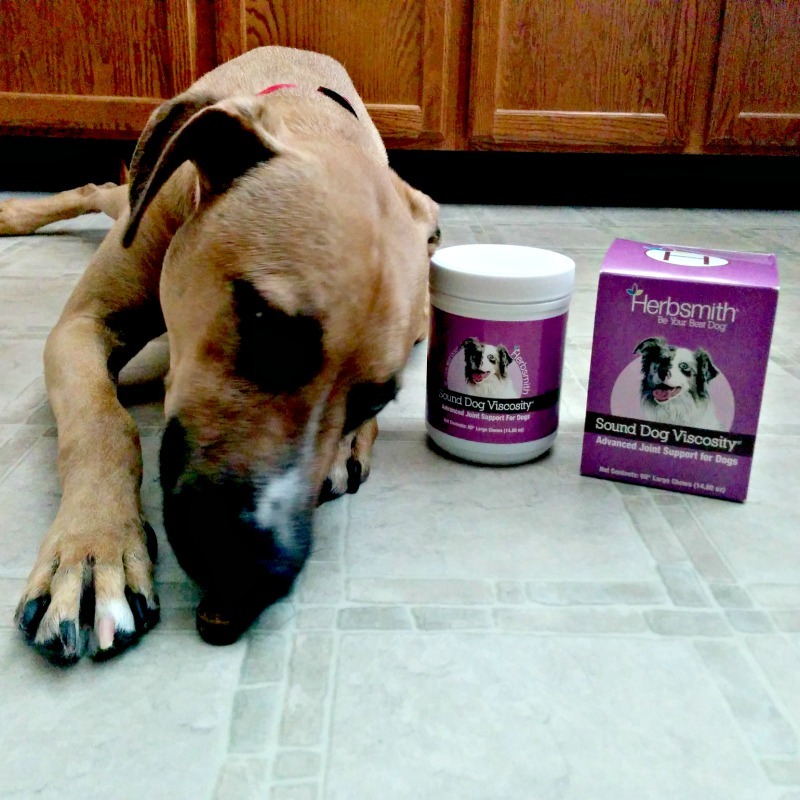 Sound Dog Viscosity – It’s A Wonderful Joint Support Supplement For Dogs! When dogs have joint issues, it can be a serious problem. It can cause them much discomfort and pain. It can make mobility difficult (which can lead to further problems). And, it’s really hard for a dog’s owner to see their fur baby in distress. I currently have 2 rescue dogs in my home. One is young, with prior knee surgery. The other is 10-years-old and seems to have arthritis. The older dog, James, is slow to rise and takes a while to get moving when first woken up. However, we’ve had the opportunity to try Herbsmith’s Sound Dog Viscosity for joint support and we’ve already noticed a difference and more ease in movement in James. What Exactly Does This Joint Supplement Do? Sound Dog Viscosity is a glucosamine-based formula for a dog’s joint support. According to the package, it helps “by maintaining the normal viscosity of joint fluid. . . . Glucosamine, chondroitin, and hyaluronic acid help to maintain synovial fluid that lubricates joints and may help to stimulate the production of proteoglycans which help maintain the health and resilience of joints and connective tissue.” Sound Dog Viscosity “provides the building blocks for synovial fluid, cartilage, and connective tissues of the joint” (taken from the package). I think that’s pretty impressive support from one supplement. 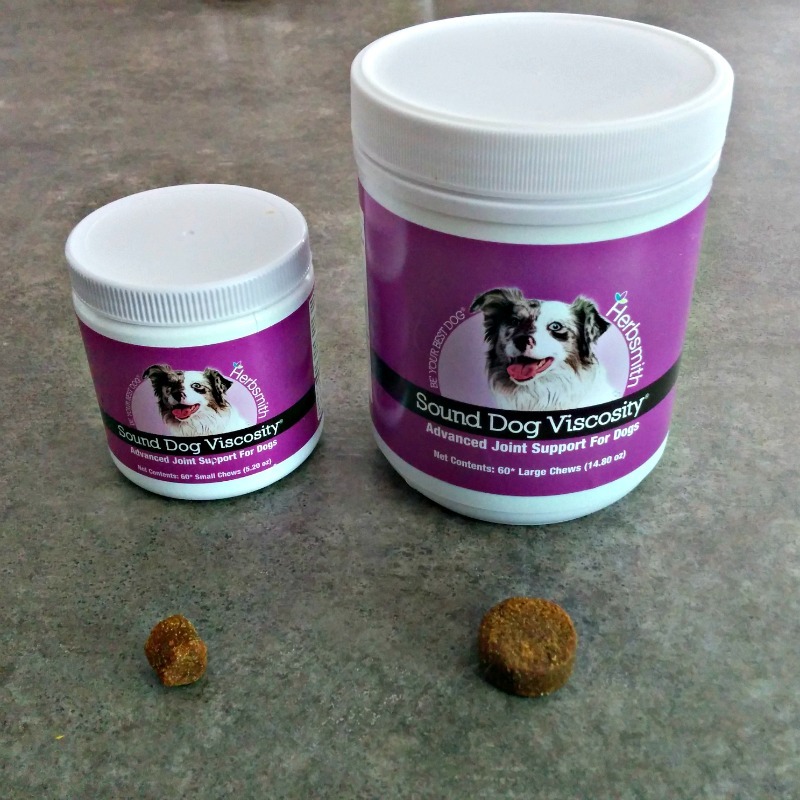 Sound Dog Viscosity – My Dogs Liked It! I provided these chews to both of my dogs. Both dogs loved eating the chews. In terms of my younger dog, it was difficult to see if the supplement made a difference because he’s young and very active and strong as it is. In other words, he doesn’t really seem to have any issues causing him problems yet. However, I’d love to keep giving these supplements to him for his joint health. The older dog definitely seemed to show that he was already benefitting from the supplement. Before the supplement, he was kind of slow on walks. After being on the supplement for a while, he was able to run more often or walk fast on our walks. He seemed to be able to move more easily, too. Seeing such a difference, I would love to continue him on the supplements. According to the package, this supplement can be used in dogs of all ages (the dosage varies per weight according to the directions). Do note, this supplement is not for use in pregnant animals. Also, it is recommended that you check with your veterinarian before giving your dog this supplement. The active ingredients in the chews that I received include glucosamine, MSM, chondroitin, frankincense, corydalis, curcumin, yucca, and hyaluronic acid. Some of the above ingredients have anti-inflammatory properties to help dogs. The founder of Herbsmith is the veterinarian, Dr. Chris Bessent. She believes in holistic care and in providing quality, natural supplements for the common problems that dogs and cats deal with. Sound Dog Viscosity is available for purchase on the Herbsmith website. You can purchase it in the form of powder or chews. The website also provides guidance as to the dosage. However, as mentioned above, please consult your veterinarian before giving your dog this supplement.